Jonathan Safran Foer meets Jeffrey Moussaieff Mason in a poignant, provocative memoir of survival, compassion, and awakening to the reality of our food system. Jenny Brown was ten years old when she lost a leg to bone cancer. Throughout the ordeal, her constant companion was a cat named Boogie. Years later, she would make the connection between her feline friend and the farm animals she ate, acknowledging that most of America’s domesticated animals live on industrialized farms, and are viewed as mere production units. Raised in a conservative Southern Baptist family in Kentucky, Brown had been taught to avoid asking questions. But she found her passion and the courage to speak out. 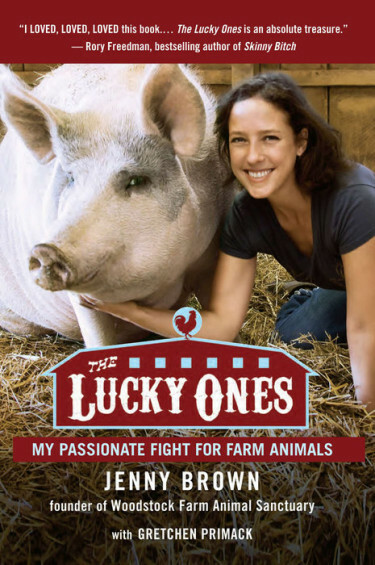 The Lucky Ones introduces readers to Woodstock Farm Animal Sanctuary which Brown established with her husband in 2004. With a cast of unforgettable survivors, including a fugitive slaughterhouse cow named Kayli; Albie, the three-legged goat; and Quincy, an Easter duckling found abandoned in New York City, The Lucky Ones reveals shocking statistics about the prevalence of animal abuse throughout America’s agribusinesses. Blending wry humor with unflinching honesty, Brown brings a compelling new voice to the healthy-living movement—and to the vulnerable, voiceless creatures among us.